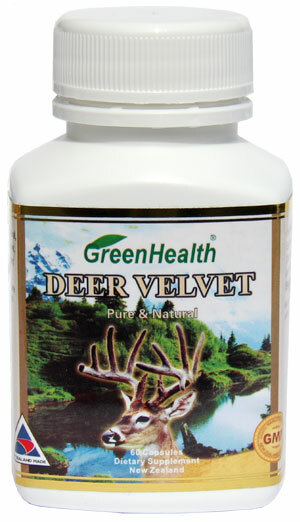 Green Health Deer Velvet is 100% natural, premium quality New Zealand deer velvet. For centuries, deer velvet has been used to relive the pain and inflammation associated with arthritis, support joint care and mobility, and assist muscle tone and general wellbeing. Each Capsule contains: New Zealand Deer Velvet (equiv to fresh) 1000mg. No artificial flavorings, preservatives, sugar, salt added. Deer velvet antler is poised to be one of the most versatile multipurpose natural remedies to arrive in the West. While we make no medical claims about deer velvet antler, we are still learning about healing potential. Traditional oriental medicine uses antler velvet to control blood pressure, to increase hemoglobin in the blood, to improve muscle tone and glandular functions, and to heal conditions as diverse as stomach ulcers, enlarged prostrates, and menstrual disorders. We know of personal, individual testimonials that taking deer antler velvet has resulted in dramatic improvement in a variety of diseases: multiple sclerosis, chronic eczema, varicose veins, and gout. A conventional use of deer antler velvet in New Zealand and Australia has been to ameliorate the pain and inflammation of arthritis, joint paid, back problems, and muscle fatigue or weakness. It is regularly used for post-operative recovery of patients in Russia.